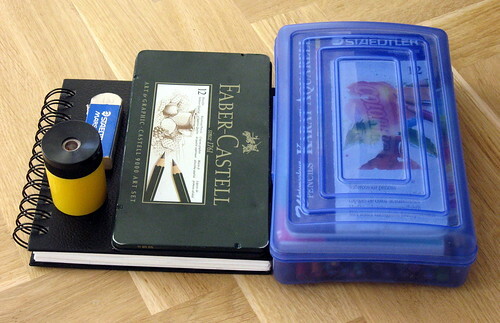 Clockwise, it consists of a small sketchbook, some watercolour brushes, 2 black pens, a refillable eraser barrel, the blue plastic pencil box (containing a mini-sharpener, a gum eraser, a kneaded eraser, and an assortment of pencils and pencil crayons), large pencil sharpener and eraser, watercolour paper postcards, a strip of paper with my pencil crayon spectrum of what's in the box (42 colours), a box of watercolour pencil crayons, and a box of pencils. As you can see, there's certainly some duplication, so it could be smaller. 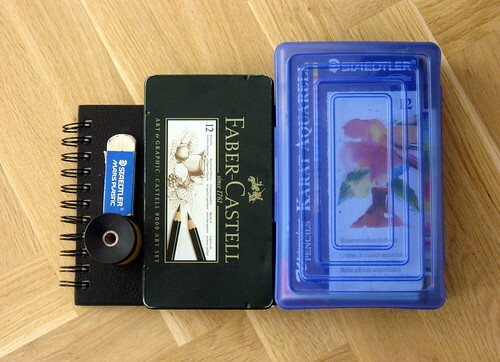 I used to have fewer of the loose pencil crayons so that the box of pencils also fit in the blue plastic box. But this has grown organically with things I liked to have available. For example, I prefer the pencil sharpener that catches the shavings to the mini one that fits in the box. And I do like to have a big range of colours in my coloured pencils... overall, it's still pretty compact. If anyone else reading this has a travel art kit, I'd be interested to hear what's in it! If you're thinking of making one, I highly recommend having a hard-sided pencil box rather than a fabric case, so that your art supplies are protected (and if anything is leaky, it's contained). On an unrelated note, nice weather in February (ie. hovering around 0°C), often with no snow, is amazing. I'm usually feeling quite downtrodden by the grey, cold weather in February and know it will continue in March. This year, it's been unusually cold and snowy in Amsterdam, but that translated to balmy for us, in comparison to a Montreal February. And March is starting off with a glorious sunny day! After this blog post, I'm off for a walk, maybe to one of the numerous year-round outdoor markets. 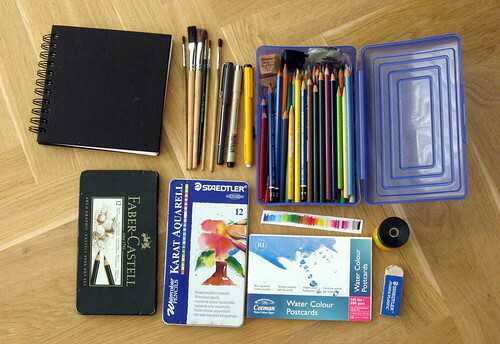 In mine I have my sketchbook (I have to keep this in a bag because the edges fray really easily), my pens, mechanical pencil, lead refills for said pencil, eraser, gluestick, scissors and a ruler.